Imam al-Husayn b. Ali (a.s) is the second son of Imam Ali (a.s) and Lady Fatimah al-Zahra (a.s), as well as the grandson of the Holy Prophet (s.a.w). He plays a particularly unique role in the religion of Islam as he is the Third Holy Imam, as well as the “Reviver of the Faith” through whom the religion was preserved. The Imam was born in the 4th year after Hijrah, and was shown particular care and sympathy by his family, including the Holy Prophet Muhammad (s.a.w), who had been warned by the Angel Gabriel about the tragedy that would eventually befall Imam Husayn (a.s) in the land of Karbala. 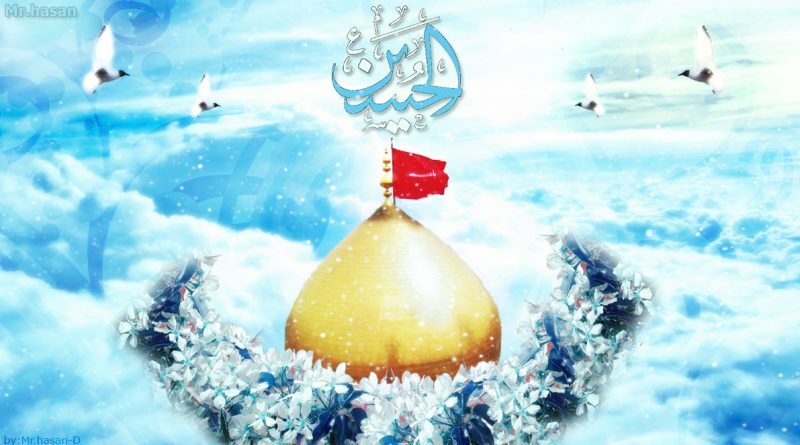 Amongst the more well known merits given to Imam Husayn (a.s) by the Holy Prophet is the title “Sayyed al-Shabab Ahl al-Jannah” (The Leader of the Youths of the People of Paradise), a title he shared with his older brother and predecessor, Imam al-Hassan (a.s). Imam al-Husayn (a.s), much like his brother, possessed many qualities and merits which were exclusive to members of the Holy Household. The most notable of these include Imam al-Husayn’s (a.s) inclusion in the Kisa’a of the verse of Purification (Al-Qur’an 33:33), as well has his inclusion in the Mubahila challenge as a ”son” of the Holy Prophet. Imam al-Husayn (a.s), more so than any other member of the Ahlulbayt, has become a symbol of patience, suffering and the struggle in the path of God. As an individual, Imam al-Husayn (a.s) had to physically and psychologically endure witnessing the tragedies that befell every single one of the Holy Household preceding him. After the death of Imam al-Hassan, Imam al-Husayn patiently observed the treaty his brother had signed with Mu’awiya. The treaty stipulated the return of caliphate to him after Mu’awiya’s death, but the treaty was violated and Mu’awiya’s son Yazid b. Mu’awiya was forcibly instated to power by his father prior to his death. Islamic values had deteriorated considerably, al-Husayn refused to stand back and watch while the sanctity of Islam was being destroyed. Imam al-Husayn initially received a pledge of allegiance from the Kufan people requesting him to lead them against Yazid, however Yazid forced the Kufan army to renege on their pledge, which resulted in Imam al-Husayn leading a small group of only 72 against an army of 30,000 of Yazid’s men to fight for the survival of Islam. In the Year 61 A.H, Al-Husayn after watching all of his companions and many family members being killed one by one, he was murdered by Yazid’s army. However through his great sacrifice, Islam as a religion was awakened and the Umayyad state encountered stiffer opposition which was ignited by al-Husayn’s sacrifice.